SUNWAY City Bhd (SunCity) will launch a mixed use commercial project worth over RM1 billion at Sunway City Ipoh (SunCity Ipoh) in Perak, as one of the catalysts to recoup its investments in the township which started in 1995. Managing director for property development Ho Hon Sang said the project, earmarked as a shopping village, will comprise a mall, retail, SOHO (small office/home office) and apartments. 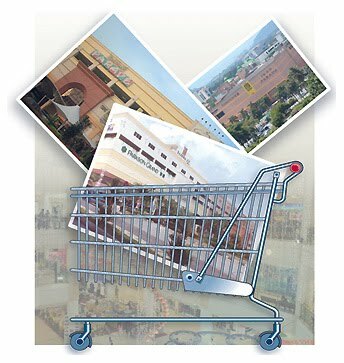 "This project will revolutionise the shopping experience in Perak. We are banking on it," Ho told Business Times in an interview at Bandar Sunway, Selangor, recently. Ho said new projects will include the development of 1,000 units of hillside bungalows, semi-detached homes and apartments, 16 units of lakeside bungalows worth over RM2.5 million each and a convention centre. 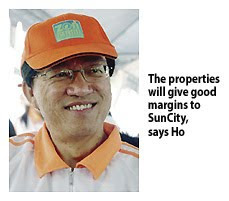 The properties are worth over RM300 million and will give good margins to SunCity when launched over the next few years, he said. SunCity Ipoh, sprawled over 560 hectares, started with infrastructure development but was halted for five years because of the Asian financial crisis. Work resumed in year 2000 and the first residential project comprising 452 units of semi-detached garden villas was launched in 2002. As demand for high-end properties improved, SunCity launched bungalows, lakeside villas, cluster houses, and apartments. The properties were slow to sell but sales picked up as the township grew. The prices had appreciated between 22 per cent and 66 per cent, Ho said. "Now that the township is mature, we are launching new products, targeting the medium- to high-end segment to give us higher returns," he said. Ho said SunCity will soon launch the second phase of MontBleu, which is the first gated and guarded community at the township. MontBleu comprises 220 units of three-storey townhouses with selling prices from RM450,000 onwards. The units range from 1,680 sq ft to 3,336 sq ft with a 25ft backyard garden. Ho is optimistic that the second phase will sell out, judging from the sales from phase one, which had 98 units and where 70 per cent of the units were sold within two months from its launch in December. "Many foreigners are buying our properties as their retirement or holiday home under the Malaysia MySecond Home plan. We expect it to continue," Ho said. Tycoon Li Ka-Shing's Cheung Kong Group is believed to have won a bid to buy the three TMW Asia Property Fund's shopping complexes put up for sale in Malaysia. Business Times was informed that the party would pay less than the RM500 million asking price set earlier but above the RM400 million level. Sources say that the due diligence process by the Hong Kong bidder had been completed and it was a just a matter of signing on the dotted lines. It is understood that a sale and purchase agreement will be signed very soon. Real estate agent, Rahim & Co's managing director Robert Ang, when contacted by Business Times (BT) to confirm the news, declined to comment. Last month, BT reported that Cheung Kong Group had emerged as the front-runner for tender which closed on March 8 2011. The German-based TMW had put the Klang Parade in Selangor, Ipoh Parade in Perak and Seremban Parade in Negri Sembilan on sale. It acquired theassets in 2005 from the Lion Group for RM340 million. TMW is managed by Pramerica, the real estate investment management business of Prudential Inc from the US. However, it is unclear which company or fund under the Cheung Kong group is purchasing the assets. Cheung Kong helps manage AmFirst REIT in Malaysia via its affiliate ARA. ARA Asia Dragon Fund, another affiliate of Cheung Kong, bought two properties in Malaysia last year - One Mont' Kiara in Kuala Lumpur and Aeon Bandaraya Mall Melaka - for RM710 million. JOHOR BARU: Country View Bhd is optimistic that the company's on-going property project, Nusa Sentral, will do well due to its strategic location. Marketing manager Andrew Tan said prospective buyers would be attracted to the housing scheme's location within the development of Nusajaya in Iskandar Malaysia. He said Nusajaya, which was also easily accessible from Singapore via the second link crossing, was another factor that would attract buyers. “Most of our buyers for phase one are Malaysians working in Singapore who commute daily to the republic using the crossing,'' Tan told StarBiz. He said other buyers were upgraders from nearby areas such as Gelang Patah, Ulu Choh, Pontian, Pekan Nenas and Skudai. He said all non-bumiputra lots for the phase one comprising 312 units of five-room double-storey link houses with built-up areas ranging from 2,100 sq ft to 2,300 sq ft and priced from RM338,000 had been sold out. Tan said Nusajaya was progressing well and completed and soon-to-be completed major projects would add value to the properties within the development zone. Two major projects in Nusajaya Kota Iskandar, Johor Sate New Administrative Centre, and Puteri Harbour Waterfront development are already completed. Other projects slated for completion within the next one to three years include the Newcastle University Medical Campus, Marlborough College, Netherlands Maritime Institute of Technology and Legoland Theme Park. Nusajaya, spanning 9,600ha, is one of the five flagship development zones in Iskandar Malaysia. The other four are the Johor Baru City Centre, Eastern Gate Development, Western Gate Development and Senai-Kulai. “Accessibility to the area will improve when the RM1bil New Coastal Highway linking Nusajaya and Johor Baru city centre is completed by the end of the year,'' he said. Tan said Country View would be launching 217 units of double-storey link houses for phase two with indicative pricing of between RM358,000 and RM418,000 and three-storey shop offices this year. Nusa Sentral is located along Jalan Gelang Patah-Lima Kedai on a 121.40ha site and the project will keep the company busy for eight years. For the financial year ended Nov 30, 2010 (FY10), Country View recorded a net loss of RM8.19mil on revenue of RM23.25mil compared with a net loss of RM3.74mil on revenue of RM51.49mil FY09. KUALA LUMPUR: Bank Negara Malaysia’s (BNM) recent hike in interest rates may do little to dampen the property market as demand is expected to continue amid rising inflation. Analysts said demand for property was expected to continue growing as the trend of rising rates was merely a normalisation process as previous lending rates were “too low”. Additionally, there was still plenty of liquidity in the market. “The rate hike was expected, and there is generally still a lot of liquidity in the market. And the demographic is such that there is still a lot of demand for property. “Property is a big hedge against inflation so people are still looking at it. The rate hike would not have a significant impact on the property market,” an analyst told The Edge Financial Daily. Given the rising fear and the uncertainty about inflation, the analyst said interest in the property market was not about to wane anytime soon. BNM raised the overnight policy rate (OPR) by 25 basis points (bps) to 3% on concerns of inflation. The increase in the OPR will result in an increase in the country’s base lending rate (BLR) which could negatively affect domestic spending and the property market. The central bank also increased the statutory reserve requirement (SRR) ratio by 100bps to 3%. In a recent report, CIMB Research noted that loan applications for residential property showed a strong rebound in March with a 74.1% increase from the previous month. The research house said the rebound could have been driven by borrowers who rushed to lock in low interest rates in anticipation of higher borrowing costs in the near term. Property prices have been on a steep uptrend in the last two years. CIMB said house prices in Malaysia rose last year at an average gain of 6.7%, the strongest in the past 13 years, including the mid-1990s property boom. The Klang Valley alone enjoyed a strong rebound from the contraction in 2009, with Kuala Lumpur recording the steepest appreciation of 12.2%. However, the analyst noted that the increase in property prices had moderated. “While property prices are not going down, the increase is slowing down or stabilising. Still, it may be a bit too soon to say property prices are cooling,” he said. Industry observers noted that property prices in Southeast and North Asia, especially in heavily ethnic Chinese populated areas, had generally been resilient. Apart from blips caused by financial crises, prices rarely pulled back due to strong demand because culturally, properties are viewed as good investments or a hedge against inflation, the observers noted. CIMB noted that the 33% jump in property transaction value in 2010 came as a surprise as it expected the rebound to be 10% to 15%. “For the overall market, we expect transaction value growth to slow down to around 15% to 20% as historically, growth has never sustained at 30% for more than a year and the base of comparison is also much larger,” CIMB said in its report. Escalating property prices have been a much talked-about topic of late as the rapid inflation in asset prices has made it difficult for young adults to own houses. CIMB said the affordability index for residential properties in general slipped slightly last year. Additionally, Malaysia’s household debt was growing making home ownership difficult. BNM’s Financial Stability and Payment Systems Report 2010 showed that an average Malaysian household’s debt service ratio (the ratio of the debt payments to disposable income) was at 47.8% last year. This implied that nearly half of Malaysian households’ disposable income went towards repaying debt, a ratio which suggests that either household debt is too high, or incomes are too low. The government is embarking on means to make housing more affordable. It was reported that it was in the initial stages of establishing a national public housing authority similar to the one in Singapore that would build affordable, quality homes. In the longer term, some quarters expected more supply to come onstream in the near future, which could ease property prices. Some expect to see a correction in prices later this year or early next year, as interest rates continue to rise and governments around the region take more steps to cool property demand. An industry observer also noted that a number of properties sold with minimum upfront and deferred payment schemes would also be completed within the next year. KUALA LUMPUR: BERTAM ALLIANCE BHD’s unit has inked a joint development agreement for a mixed development project of residential and commercial shoplots in Johor with a gross development value (GDV) estimated at no less than RM400 million. In a statement Monday, May 9, Bertam said its wholly owned unit UH Capital Sdn Bhd had entered into an agreement with GJH Development Sdn Bhd for the joint development of 270 acres of land at Mukim Seroh in the district of Ledang in Johor. UH Capital owns the land, and GJH is the developer. Bertam said the land would be developed in two phases and the planned joint development was expected to commence upon receiving approval from the relevant authorities, with completion expected within six years. It said all the costs and expenses to be incurred in relation to the proposed joint development would be borne and paid by the developer. Bertam said that under the agreement, the developer guaranteed that the GDV for the two phases shall be not less than RM200 million each, and that the landowner’s entitlement would be no less than RM40 million for each phase. On the rationale for the agreement, Bertam said the proposed joint development would allow it, through UH Capital, to unlock the value of the land without having to fund the development cost of the project. “Furthermore, there will be general cost savings arising from the interest savings from bridging loans, which would have been required if UH Capital were to develop the lands on their own,” it said. As for the funding of the project, Bertam said UH Capital was not required to finance the development and that GJH shall be solely responsible to meet and defray the development costs in the implementation of the project. 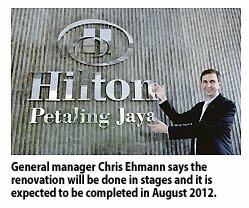 PETALING JAYA: Hilton Petaling Jaya will undergo its first major renovation in more than a decade, beginning this month. The makeover, which will involve all its guest rooms, meeting rooms and the ballroom, is expected to involve some RM50 million. General manager Chris Ehmann said that the renovation will be done in stages and it is expected to be completed in August 2012. Hilton, which has been managing the property for the past 27 years, has been signed on to manage the hotel until December 31 2025. The hotel is owned by Tradewinds Corp Bhd. "We will start with six floors on May 9," Ehmann told Business Times in an interview recently. The hotel has 553 rooms, 17 meeting rooms and a ballroom that can accommodate 600 people. "The investment will involve all infrastructure such as hot water, new televisions, telephone lines and the back of house," he said. Ehmann said that its most recent makeover was in 2005/2006 which involved all its food and beverage outlets, main lobby and the public area. Once completed, Ehmann expects both occupancy and average room rates to increase in line with its new product offerings. "We pride ourselves on our service and we are excited about the products that will match our service," he said. When asked about the surrounding competition, he said "It is the people who make the difference." About 75 per cent of its guests are business guests as the hotel is focused on corporate travellers. The hotel is essentially divided into three parts: the Main Block (10 storeys), the East Wing and the West Wing, each with 21 storeys. The hotel, which started as Jaya Puri, came under the Hilton management in 1982. It closed for two years, underwent a RM40 million renovation, added a tower and reopened as Petaling Jaya Hilton. In 1992, another tower block was added at a cost of RM75 million. Later, the hotel was renamed Hilton Petaling Jaya. Ehmann said that Petaling Jaya residents will be particularly happy with the refurbished product as it is an iconic building in the area and most people have fond memories of the place. "We are putting Hilton Petaling Jaya back to her glory days," he said.